You either love bitter melon (khổ qua) or you hate it and nothing in between. Growing up Kim loved it and ate bitter melon soup (canh khổ qua) and stir fries routinely while I, on the other hand, despised it’s bitterness so mom rarely made it. But over the years I’ve come to love it. Don’t get me wrong, bitter melon is still as bitter as I remember it, but the latent and underutilized bitter tastes buds in me, over time, has come to appreciate the complexity of this bitterness and even crave it. A member of the squash family, bitter melon is grown all over the tropics of both the western and eastern hemispheres. Indian, Chinese, Okinawan, Phillipines, Indonesia along with Vietnam are among many of the countries where bitter melon is a popular culinary vegetable. In Vietnamese, bitter melon is known as mướp đắng with the term đắng meaning bitter. 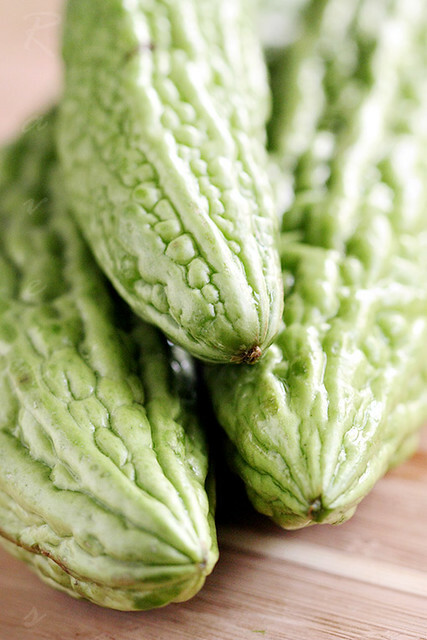 Although more appropriate and literal to the meaning of bitter melon, the term mướp đắng is not commonly heard among households and not what the supermarkets call this vegetable. 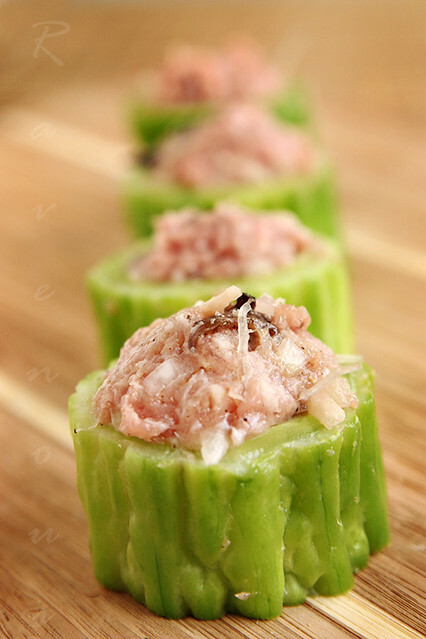 Instead, it’s more commonly known as khổ qua which doesn’t mean either bitter or melon. Khổ roughly means hardship and qua in this context means the past. We like to think that the Vietnamese language and people are quite creative and chose to call this vegetable khổ qua because of life’s tumultuousness. Clearly the history of the Vietnamese people have anything but smooth sailing. Thus by eating khổ qua, you will be constantly reminded of life’s ups and down, and lest you forget and enjoy your meal too much, it’s bitterness will always be there as a reminder of life’s bitterness. But honestly, it’s probably an example where language was lost in translation. The Chinese mandarin term for bitter melon is ku gua and the Vietnamese term khổ qua may have been a just a literal translation with an accidental, albeit melancholic meaning to this lovely gourd. While the bitterest of vegetables, bitter melons aren’t uniformly bitter. Ripe ones are less green and more white to yellow/orange tend to be milder then the younger counterpart. Choose your melon base on your level of bitter tolerance and start off with ripe ones if you’re new to bitter melon. But enough about entymology and background on bitter melons–you’re reading our blog for the recipes right? 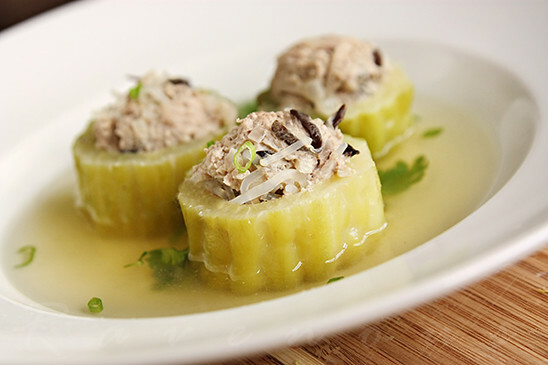 This simple bitter melon soup (canh khổ qua) is a classic Vietnamese preparation often served at family dinners and is equally simple to make. 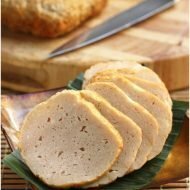 Use the same Vietnamese pork stuffing as in our stuff tomatoes, stuffed tofu, and stuffed squid. Blanching is an optional technique to reduce a bit of the bitterness. Quickly blanch the entire bitter melon in boiling water for about 1 minute–the color will turn a dark green. Remove and allow to cool. When cool to the touch, slice melons cross wise into 1 to 1.5 inch pieces. Using a table spoon or knife, drive it between the green outer flesh and the center white pith. Hold the bitter melon in one hand and spoon/knife in other, and slowly core out the pith and seeds with a circular motion. Add the peeled shallot to the water/stock and bring to boil. In the meantime, stuff the bitter melons with the pork stuffing. When water/stock is boiling add the stuffed bitter melons and cover reducing heat to low, cook for about 15 minutes or until the center of the pork is done. Season with some salt to taste. Transfer to soup bowl and garnish with chopped green onion and cilantro. Serve with jasmine rice. Cooks note: Add a peppercorn on top of the pork stuffing for additional spiciness which will cut down on the bitterness. Skip the blanching if you love the unadulterated full bitterness. Also for additional bitterness you can save the liquid from the blanch for the soup. Discard if you’re using chicken stock. 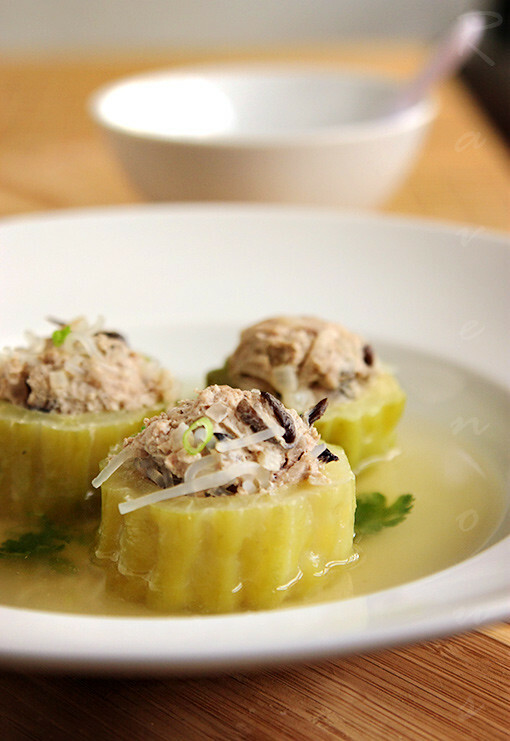 The simple broth is infused with sweet flavors of pork intermixed with the bitterness of the melon. We admit that bitter melon is not for everyone–at first. It’s an acquired taste that once you enjoy it, you will probably not only like it, you may even crave it. Instead of being reminded by life’s bitterness, hopefully it is quickly forgotten with this homely yet comforting soup–at least until the last drop. In a large mixing bowl, mix together the pork, fish sauce, sugar, pepper, salt, shallots, wood ear mushrooms, bean thread noodles and mix well. Cover and set aside. Blanching is an optional technique to reduce a bit of the bitterness. Quickly blanch the entire bitter melon in boiling water for about 1 minute--the color will turn a dark green. Remove and allow to cool. When cool to the touch, slice melons cross wise into 1 to 1.5 inch pieces. 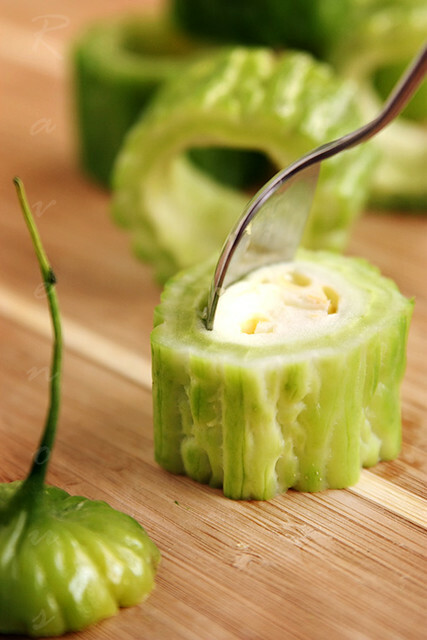 Using a table spoon or knife, drive it between the green outer flesh and the center white pith. Hold the bitter melon in one hand and spoon/knife in other, and slowly core out the pith and seeds with a circular motion. Cooks note: Add a peppercorn on top of the pork stuffing for additional spiciness which will cut down on the bitterness. Skip the blanching if you love the unadulterated full bitterness. Also for additional bitterness you can save the liquid from the blanch for the soup. Discard if you're using chicken stock. 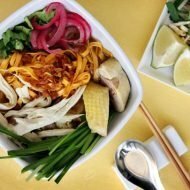 This is our entry to Delicious Vietnam,a monthly blogging event celebrating Vietnamese cuisine created by Anh of A Food Lovers Journey and yours truly! This month’s host is Dave of Javaholic blog. 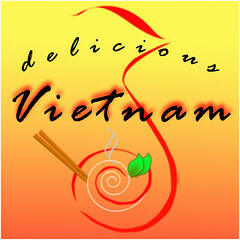 Submissions can be sent to him by October 10, 2010 at 7:00 pm pacific time via sijeleng[at]gmail[dot]com For instructions on how you can participate, visit Delicious Vietnam information page. As a child I never liked bitter melon and mum used to get me to eat this soup because it wasn't as bitter. But I just couldn't. Now I love it, we call it hu qua/hoa not sure my Vietnamese is pretty bad. It has been years since I have had a bitter melon, and I have been thinking of giving it a try again recently. My mom did a very similar preparation growing up. This is definitely a dish that I would like to try again. My mouth was watering reading about your bitter melon soup. The soup is my next bitter melon project. I like the addition of vermicelli to the filling, I haven't seen it in the recipes I've looked at. Thanks for all the info too! I have never had bitter melon soup. I would think the savory filling would balance it out nicely. 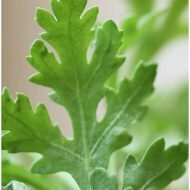 I am a broccoli rabe fan, which can be quite bitter, so maybe this is something I should try! HAHA Bittermelon, almost every Viet kid's worst nightmare… I didn't mind it as I was growing up. My parents would make this soup for us and I'd love the broth and stuffed bittermelon. Thanks for the tips about cooking it! I suppose like most delicious things in life, bitter melon is simply something you grow to enjoy overtime. My mum, too, makes this particular dish; but to give the meat stuffing a little more bounce, she prefers to mix fish paste with the pork mince. Although I have to be honest, our version looks much less elegant than yours (more err…robust I guess?!). I haven't had this in so long! Thanks for bringing back the memories. I definitely want to try it and see if it is as good as I remember. Personally I can't stand bittermelon but when prepare this way I will eat it! i used to really dislike bittermelon as a kid, but i'm growing to love it now, especially if it's cooked well. this looks delicious! This is one of my all-time favorite comfort foods! I have never made it myself (just my grandma makes it) and I have never seen her blanch the bittermelon first. I think I just found a recipe that will give my grandma a run for her money! Used to hate this but I like it now. I normally braise it with chicken and fermented bean sauce. My Mom's family is from Suriname and this vegetable is common and she has been trying to get me to eat it since I was a child. Now I am older, she tries to tell me all the wonderful health benefits. I have never liked it, but I am willing to try this one. This recipe looks like it might kill some of the bitterness. Ah, this is called ampalaya in the Philippines. Pork and amopalaya — classic! Thank you all for your sharing your stores about bitter melon..it's so interesting to read everyone's comments! I definitely didn't take to bitter melon at first. Now I'm a fan. The Vietnamese always watch you with hopeful anticipation as you dig in, like you're opening a birthday gift. I'd always tell them 'dắng!' to which they'd respond 'những mà mát!'. Oh, Vietnam. Yes… The memories of being forced to eat this as a kid. I still don't like bitter melon as an adult. However I will eat it as oppose to only eating the meat filling. I really like your authenticity to the Vietnamese cuisine. Great job. I hope you will post a recipe for my personal favorite- mi quan. @anonymous: thanks for enjoying our blog and leaving us the note..we also enjoy mi quang as well and posted it already! Maybe one day, a few more years from now, I'll love bitter melon as much as you guys! 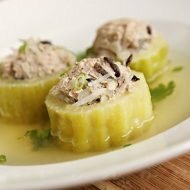 Maybe this is the dish that get me liking bitter melon. thanks so much! that’s the most common compliment we get! khổ qua is a Viet transliteration of the Chinese, whence the melon and stir-fry styles originate. Ku-gua, ku meaning bitter and gua, meaning melon 苦瓜. I can’t recall what the Cantonese pronunciation is. Several Viet and Thai veggies have Chinese names. Love the background on bitter melon! I just made it today for dinner. Ran out of the thread noodles but it still came out yummy. On tip, once made, before cooking take some and freeze them in ziploc bags. You can then quickly make the soup in pinch. Do we need to have the bean thread noodles in it? Does it make a difference if we don’t have any on hand? Just made this for my bf who loves this soup on a cold day. It turned out great. Thanks so much for the recipe! A childhood favorite! However, I am a vegetarian now, is there something to substitute with? I made this today with cabbage. It was delicious. I have tried many of your vietnamese recipes and they never disappoint. Old cheese, olives, green beans and other foultasting goodies! I’ll try to impress a man with this soup tonight,, if he dosent like it,, he might not be good for me!